A few years back, I was intrigued by the TED talk given by Sir Ken Robinson entitled Schools Kill Creativity. 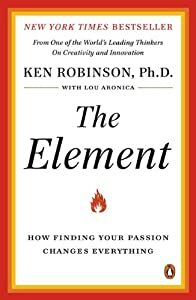 I subsequently read the book The Element and was thoroughly pleased when KSU brought him to campus for a talk. As a bit of a reflection and exercise in recharging my mental batteries, last week I reviewed the talk, the book, and my notes from his presentation and have mixed feelings. I agree that traditional education stifles creativity at times when it should embrace it. At the same time, I was somewhat baffled by the limited suggestions offered by Sir Ken in his first book to remedy the situation. During his presentation, he must have been a bit off that day, for his presentation was more shtick than learned talk. While I anxiously await to get my hands on Sir Ken’s second text which was recently released, Out of Our Minds, a book intended to explore how best to encourage creativity, I have thought a lot about the premise and content of Sir Ken’s work. From my study of this situation, I take away two things from it, one that deserves talking about in this forum, and one that is much off-topic to what we discuss here. The latter of the two findings is that it will take a massive visionary approach to changing the face of education and its traditional delivery than what we have now. It will further need a collaborative group of educators, administrators, and politicians to do so, which in today’s political clime I do not see happening. Perhaps this is a topic for a later time. The former finding is what we need to explore here and it is good news for those of us in social studies. In looking through the new standards adopted by the state of Kansas, one cannot help but note the potential for creating excitement and engagement in the classroom. The teacher has the ability to bring kids into an environment where they will be able to present findings in a multitude of ways. It is vitally important to remember that we do not abide by the same rules as professional historians…we don’t have to have our kids merely write to present findings! Throughout our curricula, we now have a great number of ways for our students to explore, to experience, and to engage in what is done in the classroom. In short, I firmly believe that these standards can offer the solution to Sir Ken’s challenge, namely, we can tailor content to the requisite skills we want students to learn, and then allow the students the opportunity to demonstrate what they have learned in as creative and wonderful means as possible. Furthermore, I believe that it is time for teacher’s to look at the best means in order to creatively encourage student learning in this new paradigm of social studies instruction. Indeed, it can be time for us to be able to stoke the embers burning deep down inside each of our students and help them find their element. If you want to continue this discussion, please comment either way to this post. This premise needs to be embraced and discussed amongst educators in Kansas and beyond. I want to take this time as well to welcome our fifth blogger to the Doing Social Studies team. Mary Madden, Education Director from the Kansas Historical Society, will be providing content after me on Fridays. Her posts will have some great ideas for you to take into the classroom.